One unhealthy personality trait that martial arts seems to bring out in some people is obsessive compulsion – perfectionism. One of my instructors likes to say that if you aim for perfection you miss a lot that is merely good along the way. Very true. One interesting place that obsession rears its ugly head is in the desire to overcome side preference. Virtually everyone is born with a dominant side, and no amount of practice will ever render your non-dominant side equal to your dominant side. Even if an external observer cannot tell the difference, you will always perceive the difference in yourself. That is just how our nervous systems are wired. Some judo instructors and competitors insist on training non-dominant throws, either equally with dominant throws, or even exclusively. I’ve even seen instructors and competitors that insist on doing two non-dominant repetitions for every dominant-side repetition. Some say that this provides a competitive advantage because opponents are not accustomed to seeing left-sided throws. Some say this is to cover a perceived ‘hole’ in the system. But others say they simply want to overcome side dominance. At Mokuren, we train judo almost exclusively on the right side, and we have not seen any adverse effects. On the contrary, it takes more than twice as long to ingrain a throw on both sides, so we produce instinctive martial artists more than twice as rapidly as those that insist on trying to overcome sidedness. Some folks will say that this produces holes in the system – potential relationships in which throws will not work right-sided. But as it works out, there are other throws in the system that cover those holes. For instance, hip throws are relatively difficult to learn both sided. So, if you learn them all right-sided then someone might argue that you will miss opportunities to do left-sided throws. But we have found that those holes in the system disappear by about shodan level because the student has seen enough of the system that they will have other throws that will cover those missed left-sided hip throw opportunities. Are there any throws you should definitely practice both sides? Bryce always gets me with a hiza guruma one way then if it doesn't work, gets me the opposite direction and tells me I should learn both ways, but that learning say Osoto gari both ways isn't important. The throws that I do ambidexterously are kosotogari and deashibarai. Hizaguruma and sasae tsurikomiashi are pretty easy to do on either side but be sure you're not obsessing on getting the same effect on both sides because uke will nearly always be more comfortable falling on one side so they will tend to airfall out of one side and turn backward out of the other side. you might get some variants of deashi (like okuriashi) to be pretty proficient on both sides. I would avoid practicing two-sided hip throws and shoulder throws because of the difficulty. I would also avoid two=sided sacrifices because they are inherently less controlled - they might get more dangerous on the off-side. You have a lot more experience than me with throws; so I can't really comment on that. However, the reason I practice my favorite forms and applications on both sides,is that I believe it gives me a mental workout I wouldn't otherwise get. I find the most difficult part of practicing a (kung fu) form on the opposite side is training my mind to do it. Therefore, I do it. Although I still practice my best side more. I teach right-handed mostly and I did mostly right-handed throws when I competed. 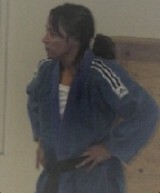 However, when my daughter, Ronda, started judo, I taught her left-handed because she is naturally left-handed. When my youngest daughter started years later, I taught her right-handed because she is right-handed. Jimmy Pedro, Jr. fights left-handed. Jim, Sr. told me that he taught Mikey (the youngest Pedro) left-handed, too, but then Mikey switched to right and did better as a right-handed player. For competitors, I think you should always have SOMETHING to the opposite side so that, as you say, there are no holes in your judo. I would put it that there should be nowhere on the mat that the other person is safe. dr. annmaria, it's great to have you reading and commenting on my blog. I've really enjoyed reading your blog and i value having your experience and insights here. keep on coming. I agree totally with your last paragraph. I think it's important that the opponent have no safe place on the mat, so you have to teach _something_ for every direction and type of motion. but it doesn't have to be any one given throw that tori is able to throw in every direction (i.e. hip throw in every direction). that's why there is such variety in the judo syllabus - so that you don't have to learn just a couple of techniques in every direction. For instance, we teach osoto and hiza as a complimentary pair because right-side hiza covers right-side osoto's holes and osoto vice versa. same thing with osoto and deashi. I think I was sorta vague in this post about whether I'm talking about training right-sided exclusively or dominant-side exclusively. Really I was talking about training one-sided (nearly)exclusively, whether it is right-side or dominant side. I've got three sons and a daughter. So far, only one is left-handed, and only one right-hander is judo age, so i haven't had to figure out the right-side or dominant-side issue yet. I've got an upcoming post in the works about different kinds of sidedness in judo. It might solve some of this confusion.